MANKATO, Minn. — Offensive line repair was the top offseason priority for the Minnesota Vikings. The sight, then, of new left tackle Riley Reiff leaving the first full-team practice of training camp on a cart prompted plenty of cringes around the field. Without any official injury reports required during the preseason, the Vikings have not explained how or what Reiff hurt. But he was a spectator, not a participant, for a fourth consecutive day on Monday. Rashod Hill, who was signed off Jacksonville’s practice squad late last season, has been taking Reiff’s place with the first-team offense. “I know he’s bummed, but he’ll be out there soon I’m sure,” right tackle Mike Remmers said. Left guard Alex Boone sounded a little more on edge, even in playful sarcasm during an exchange the other day with a reporter who asked if Reiff’s absence triggered any “oh, no, not again” feelings from the team. Turning serious, Boone went on to tout the sturdiness of his new partner on the left side of the line. Reiff has been a durable player, taking part in 78 of a possible 82 games with Detroit. Three of those absences came last season, two to a hip injury and one to an illness. He hurt his knee in 2014 and was held out of one game. 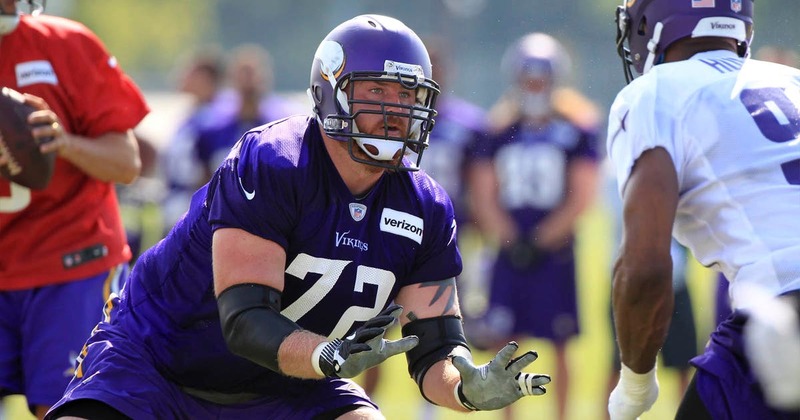 In signing Reiff and Remmers, who came from Carolina, the Vikings gave out more than $36 million in guaranteed money to solidify the tackle spots. With T.J. Clemmings moved inside to guard after his well-documented struggles with the pass rush the past two years, there’s little experience behind Reiff and Remmers if injuries are an issue as they were last season when Matt Kalil, Andre Smith and Jake Long all ended up on injured reserve. Jeremiah Sirles has returned as a utility man capable of playing four spots, after starting nine games at right tackle and one at left guard last season. When asked about the depth at tackle on Monday, Zimmer didn’t exactly offer a ringing endorsement. “Well, we need to stay healthy, I think,” he said. Hill, who went undrafted last year out of Southern Mississippi, satisfied the Vikings enough with his performance in the meaningless finale against Chicago after filling in for an injured Clemmings that they didn’t sign any other seasoned backups. With long arms and strong hands on his 6-foot-6, 309-pound frame, Hill has kept up the positive impression in practice with Reiff out. With Joe Berger settling back in at right guard and rookie Pat Elflein in competition with Nick Easton to be the starting center, there’s plenty of important work going on in the middle of the line, too. There will be no avoiding the spotlight for this group this season, not after the trouble of a year ago.